Dharma (Dharmachakra Pravartan) by teaching five ascetics in the Deer Park. After tea break, a visit to Chowkhandi stupa and Archeological Museum. After lunch a little rest. That's what the blurb said. The blurb, from our travel organiser which was not emailed to me until after we'd arrived at BodhGaya. It sounded good anyway. It wasn't quite like that though. No not at all. 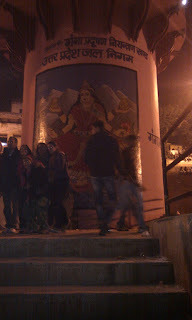 We did visit the Dhamekkh stupa I suppose. Perhaps Julia remembers more than I do. The original Dhamek stupa was built by Ashoka(273-232 BC) – the only (as far as I'm aware) Buddhist Emperor, who consolidated the rule of his father and grandfather over a large part of Northern India.. He'd been as blood thirsty as any ruler up until his conversion to Buddhism. 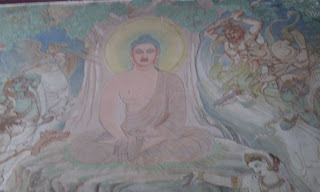 He then became a benevolent ruler promoting the buddhist path throughout the rest of his long rule, and as a result [of his conversion], 'he taught and persuaded his people to love and respect all living things'1. He had built this very large stupa on the apparent site of the Deer Park at Varanasi close to Sarnath2. The Deer Park was where the Buddha, after his enlightenment, encountered his fellow ascetics – all had lived lives of extreme renunciation (ie eating the bare minimum for survival and meditating most of waking hours). He had renounced such a path as being too extreme and left his companions some time before. He had decided on what we call 'the Middle Way' as the preferred route to enlightenment – it still sounds pretty extreme to me. But hey ho. Anyway it worked for him and then there he was in the Deer Park greeting his erstwhile companions and trying to explain to them how he did it. He spent a whole rainy season with them in the Deer Park and soon they all got enlightened too. Now he had fellow travelers to assist in giving instruction to the many who also wanted to learn the path to enlightenment. Well in those days it seemed there was loads of people wanting to hear about these new teachings and turning up to hear the Buddha and pals give talks. There were the usual Tibetan monks in orange and yellow walking around the stupa. A coach load of elderly Americans arrived... I'm not sure if they were actual buddhists like me or just rich sightseers come to view the exotic history. They came from a large air-conditioned coach outside the gates of the park, clambering down, walking round and back to air-con coach in less than half an hour. There were also various other oriental groups circulating the stupa – Japanese, Chinese, Thai – all groups carried expensive cameras with large zoom lenses. As usual a small group of beggars were congregated outside the gates – mainly skinny children in thin raggedy clothes – their minders hovered on the other side of the road, keeping a low profile. Small brown hands were outstretched, eyes beseeched – 'Please, please, please...' Me and Julia found it hard to deal with these, Julia in particular as some were the age of her grandchildren. 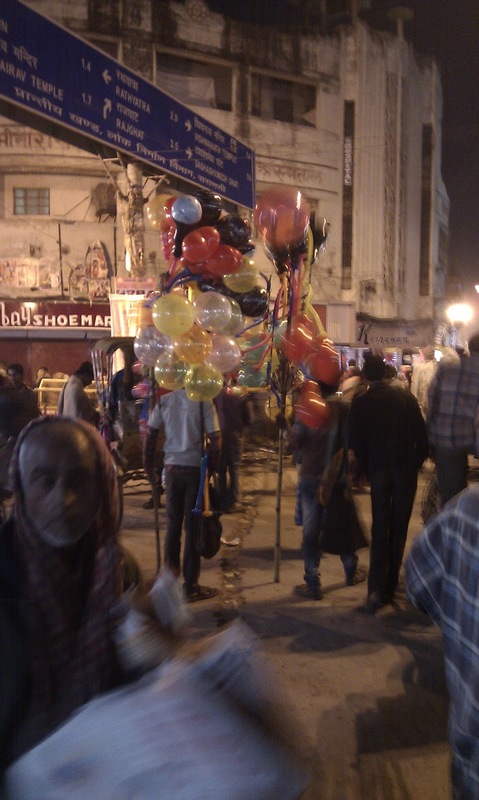 Our guide barely seemed to notice them, not in an unkind way, but so used to them he hardly saw them. They mainly targetted Western tourists, not the Indian guides in any event. 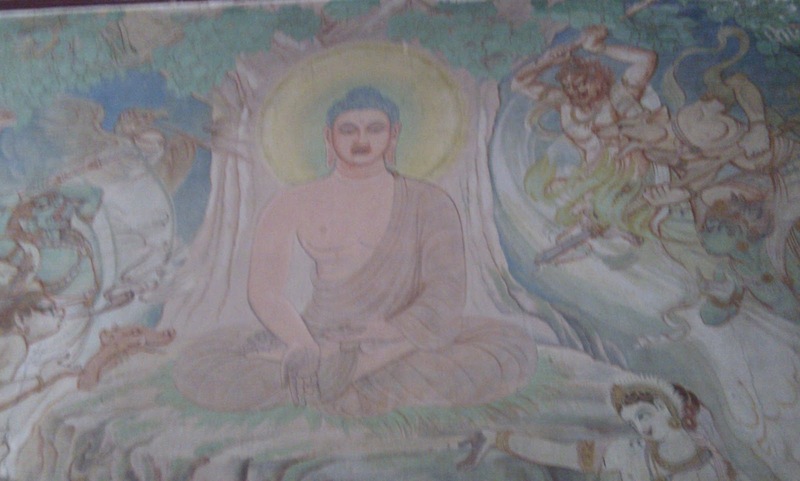 Anu gave us a quick chat about the Deer Park and what happened to the buddha there (see above). He was sweet natured and keen to please, but I found it hard due to his small stature and boyish face to see him as a real grown up. Julia treated him like one of her sons. We all went to the cafe down the road and had lunch – Julia was feeling stronger and had a mushroom omelette that day and I had a veg curry [again]. 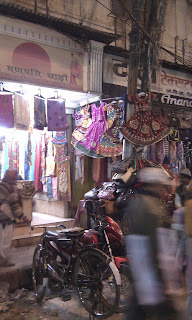 We had hot sweet chai too and Anu pointed across the road to the Museum and said we'd spend an hour there. 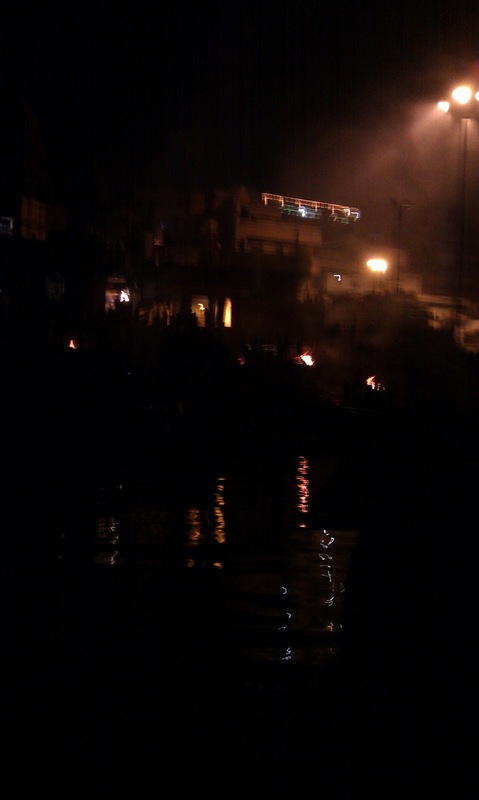 Later on we'd be going for our boat ride he explained – we might even see a funeral pyre in the distance. I didn't think too much about it really, except to think it would be exciting to finally get out on the Ganges, which I'd seen so often on TV. Now we'd be seeing it for ourselves. How exciting! I suggested that after the trip to the museum, Julia and I should go back to our room, put more warm clothes on and have a siesta. The temperature dropped at night so it was bound to be even colder out on the river. We'd have to put on all our small collection of winter fleecey tops. The museum had some wonderful carved Buddhas and wall friezes and paintings of exquisite quality – I spent as much time as I could looking at each – cameras were not allowed. Julia and Anu looked around and then went outside and sat on the steps waiting for me. It was still sunny and warmish. 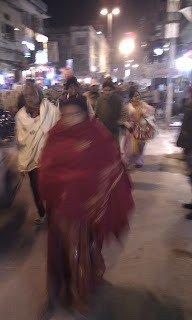 We went back to our room – although Julia shot off to see the travel agent round the corner – a) she was organising a flight for us from Varanasi airport back to Delhi (no way could she have tolerated another train journey and I tended to agree). This would be at the end of our Indian trip after visiting Lumbini, Nepal. b) she'd promised to cut the hair of the guy who ran the travel agent's. He had black hair curling thickly over his collar which I thought looked rather nice – but everyone else – friends, family etc wanted him to cut it short. He was from a well-off local family, his father was a politician and he was very knowledgeable about travel in India – much more so it seemed than our own guide. Anu arrived at the guesthouse around 4ish with our latest taxi driver – this time in an SUV with high up comfortable seating, he'd gone to our new friend at the travel agents to find this guy. Julia was pleased as she had hated the low saloon car that had brought us to Sarnath. It was supposed to be about a 2-3 hour drive, but with the usual dense fog descending and the gridlocked mayhem of traffic in every town it ended up being closer to 4 hours to get to Varanasi. Our taxi driver took the vehicle to a fenced off car park when we got there and we were told it was safe to leave our stuff in the car with him. Julia looked dubious but I was past caring by then. 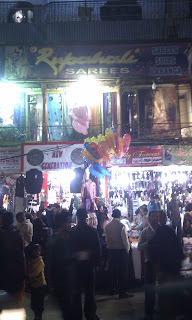 Now we were walking through utter mayhem – even though it was about 8 at night the street was crowded, bustling, with heavy traffic, stalls spilling trinkets, all sorts of shop fronts - tiny little businesses to large mobile phone shops. There was the usual sacred cows (with big horns) blithely ignoring the traffic which was weaving around them and the myriad pedestrians... Julia was holding my arm tightly – we came through the shops and through an arch and descended a long and wide stone-stepped area and there it was - the Ganges, the famous sacred Ganges, dark waters with a multitude of boats (ghats – flat bottomed, propelled by pole or oar) crowded together at the bottom of the steps which stretched for several hundred metres to our right and left. There were lights twinkling amongst them – lanterns and to our right a flood lit area below a kind of stage. Anu and his tall friend Samadi led the way. 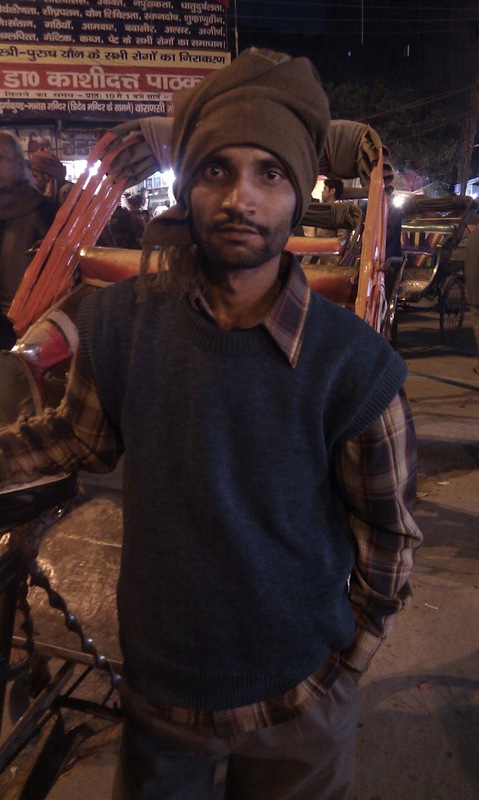 Anu as usual, was cheerful and energetic, he liked to be in charge, while his friend was quiet and said little. Anu told us to wait in a concrete railed area while he found us a boatman – was the guy prebooked or was he found through a gang leader? 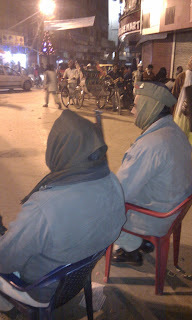 Who knows, but soon we were being bundled onto a ghat. Julia and I sat on a wooden slat at the back, chatting and Anu and Samadi sat up near the boatman, who spent 20 minutes poling us through the morass of other boats to get through to the open waters. The water was inky black and Julia and I discussed how people actually bathe in it, as it's sacred, especially round here at Varanasi. According to Lonely Planet 'this is one of the world's oldest continually inhabited cities and is regarded as one of Hinduism's seven holy cities. Pilgrims come to the ghats lining the River Ganges here to wash away a lifetime of sins in the sacred waters or to cremate their loved ones. 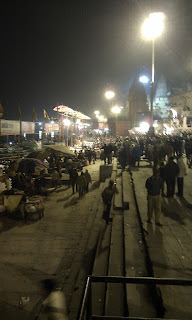 It's a particularly auspicious place to die, since expiring here offers moksha (liberation from the cycle of birth and death) making Varanasi the beating heart of the Hindu universe'. I think if you'd asked Julia at that time she'd have felt that you were most likely to die from the quality of the water, if you chose to bathe in it. 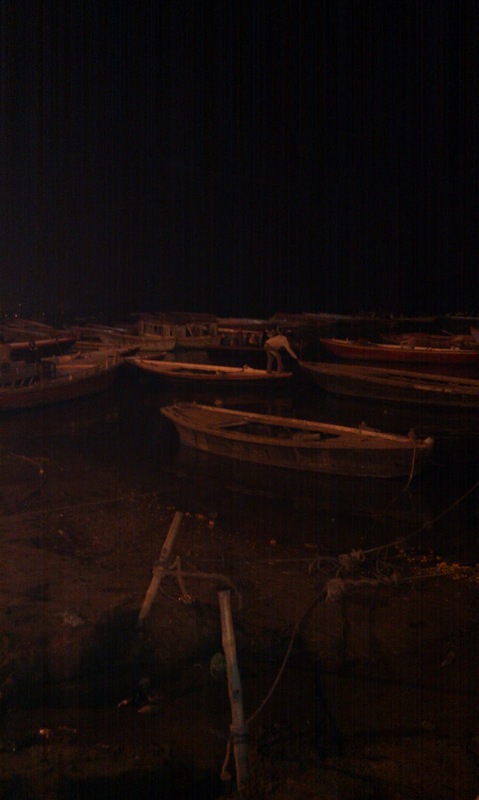 I most certainly would not have put myself anywhere in that oily dark water, auspicious or not. We speculated (with a shudder) how awful it would be to fall in.. We were in fact about to have our own encounter with death which for me was deeply unpleasant plus an unexpected drama which very much upset Julia (and all of us). There were thousands of people spectating along the area where we had embarked. 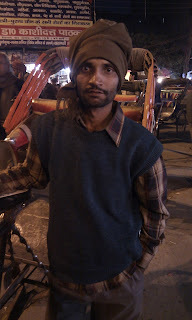 Male dancers were in orange loin cloths and top knots doing acrobatics, fires were lit and drums bongoed. The boatman stopped the boat for a while for us to watch. 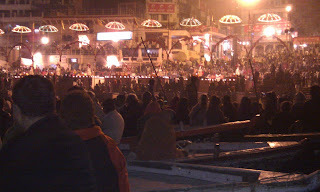 There was a row (apparently) of monks who were conducting the ceremony, higher up by the stage area, This all seemed to be part of a regular festival – probably that listed in the Lonely Planet as the 'Manikarnika Ghat' a Hindu cremation festival. 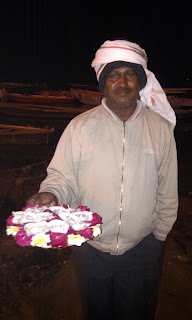 The boatman then gave both me and Julia a small candle each, set in a piece of woven twig and flower. We lit our candles and cast them onto the water in memory of loved ones who had died and watched the little light float away into the distance.. The boat was now floating up river about 100 metres or so from the shore. 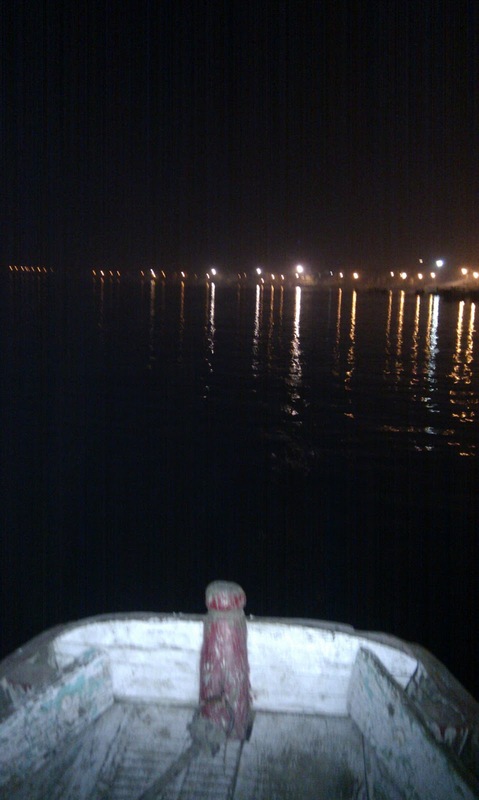 Anu was telling us that we would be able to see the cremation grounds from the boat and could go in close if we wanted. I began to feel a bit uneasy, I was not keen on watching dead people being cremated even from a distance. 'We won't go too close will we', I said, Anu as always the diplomat, said 'No, no, not if you don't want to', 'No' I said, but Julia said, 'I'd like to get close up, I think it'd be interesting'. Usually it was Julia who felt panicky about a particular situation. This time the shoe was on the other foot, it was me. Now the cremation ground was in sight, I could see, not one, but three burning fires on wooden frames, glowing on the dark hillside in the distance. As we got closer, I began to feel really panicky and begged Anu not to let the boatman get to close, in spite of protestations from Julia. We watched from a distance and I began to smell the sweet sickly scent of burning bodies as smoke rose into the air from each pyre and disippated out over the Ganges. I felt nauseous and to my relief, the boatman began to paddle away along the coast, back towards Varanasi – we were probably about a half a mile away by now, from our starting point. 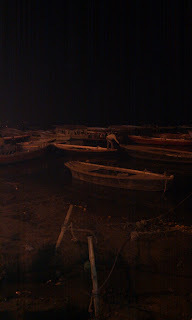 We could see pillared dark buildings along the shore and more steps and ghats and then heard voices calling. 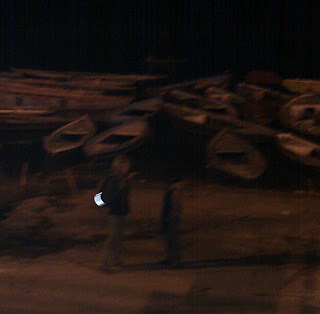 Then our boatman was calling out to a shadowy figure on a deserted stretch of steps and we were pulling over towards him. 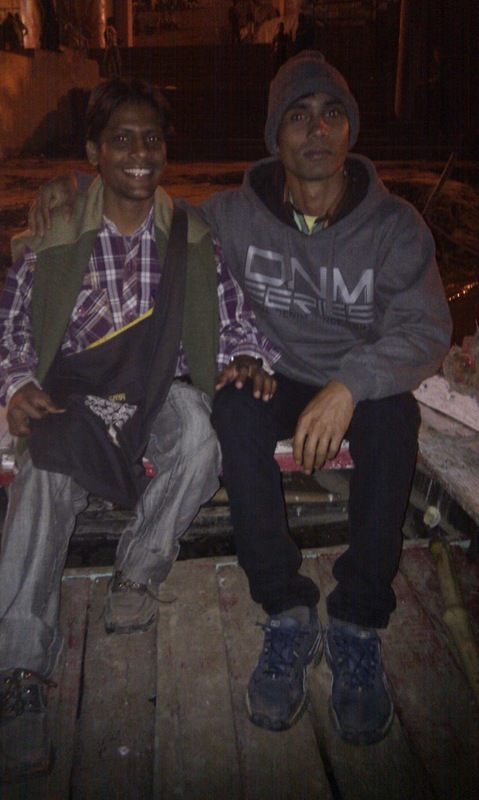 The boatman spoke to Anu in Hindi who told us we were taking a passenger onboard – someone wanted a lift back to Varanasi, someone known to the boatman. 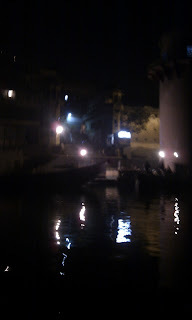 We pulled in and a tall man in his late 40s got on the ghat and the boatman started pulling away, pushing other ghats aside so we could get back out on the open waters. The man was standing in the middle of the boat and spoke to us in English – there was something not right about him, he addressed Julia in a loud, over familiar manner asking where she was from etc. She looked at me and barely answered him, turning her face aside. Anu was asking him to please sit down and then I noticed that Anu's face was getting angry, his voice rising. I spoke to Anu and suggested he calm down and not get into an argument with the guy, but Anu had a job to do ie to take care of his two middle aged female charges and as the guy did not sit down and was clearly aggressive back the row was building up. I looked carefully at the man again and realised he was drunk. Hi swaying was caused by more than the waters of the Ganges. As the argument escalated me and Julia began looking round fearfully for escape routes – but we were on the water, there were still some empty ghats next to us however. 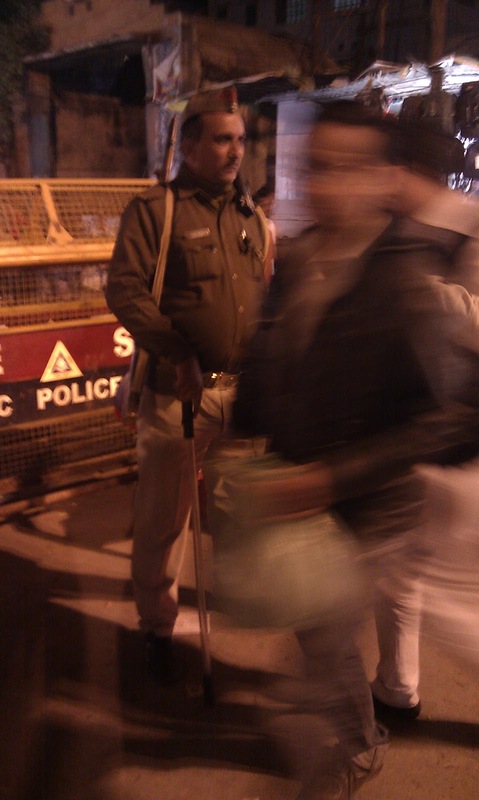 Suddenly all hell broke loose as the man swung a punch at Anu (who was still sitting down). Anu jumped up to punch him back, the boat was rocking and Julia covered her face and started screaming. I put my arm round her then pulled her up, shouting at Anu and the boatman as we both jumped onto the ghat next to us. 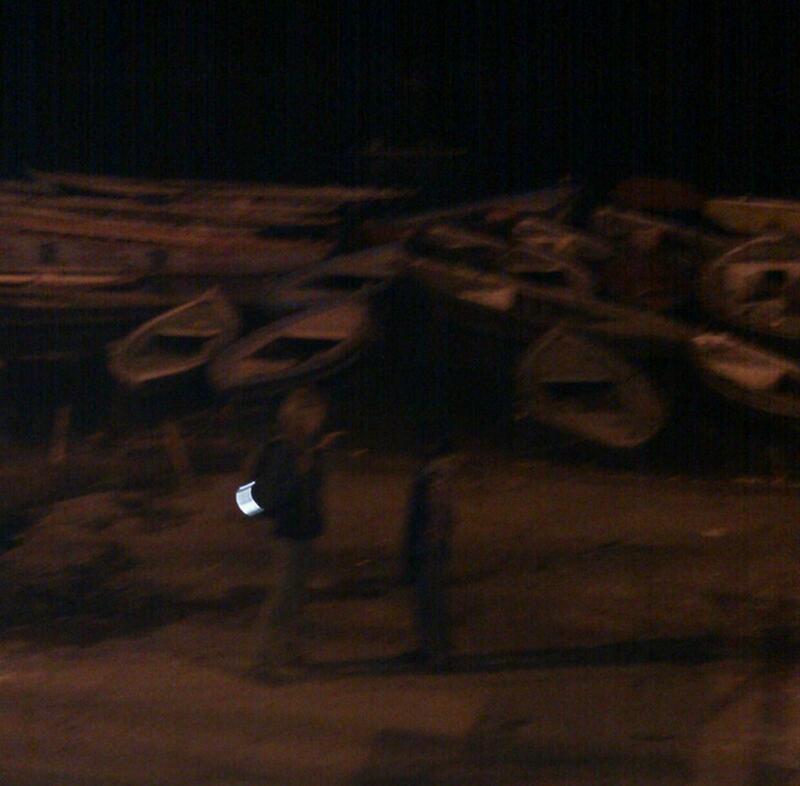 I then told Anu and the boatman that unless the man was removed from the boat we were not getting back on. 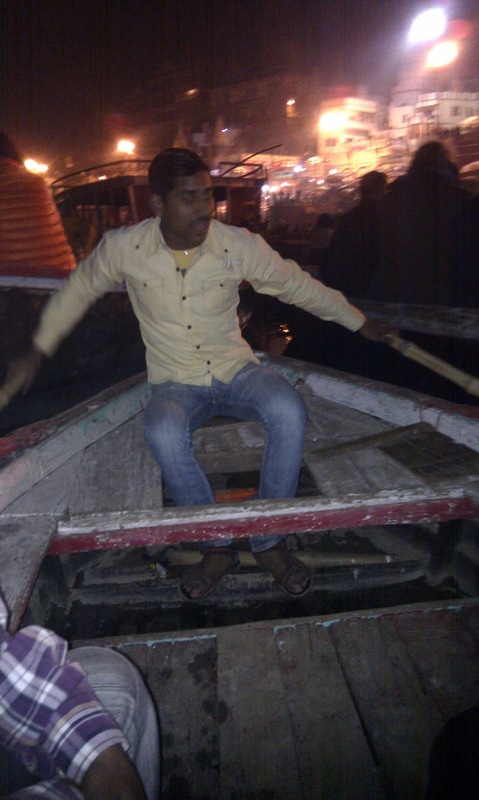 Anu was shouting at the boatman in Hindi and begging us to return to the boat. The attacker was shouting aggressivley at Anu and there was no way we were getting back on I repeated to Anu unless the man left. But he pleaded and persuaded us back on only so the boatman could return the man to the shore – the man seemed to have fallen silent. We were all considerably shaken up by this incident and Julia and I could not wait to be returned to the steps where we'd embarked – this took a considerable time of floating along the shore and then pushing and pulling other ghats in order for our boatman to bring us back to solid ground again – it was like moving the pieces of a rubic cube aound . We got up the steps, and as we came into the main square again I nearly choked on the pall of heavy smoke from the funeral pyres which had now drifted over onto the main town. I covered my nose and mouth with a scarf so I wouldn't be breathing in the ashen air. We stopped a few times for Julia to buy a few bangles at various stalls for her grandchildren, but I just wanted to get away. For me the so called spiritual atmosphere of Varanasi and the Ganges was gone, what little remnants destroyed by the aggressive encounter and the choking burning ashen air. We got back to the taxi and on the drive home Anu was clearly upset by what had happened, but playing it down.His lip was swelling up where he had been punched and he was still angry about it. He was telling the story to the taxi driver. Apparently the drunk man had been someone of power and influence who the boatman had dared not refuse for fear of repercussions. But now the boatman was very scared that we would make a complaint that would get back to the man who owned the boats and then he'd be out of a job. Anu had told him that he would not make a complaint but the taxi driver apparently was a friend of the boat owner so I was sure it would get back to him eventually. When we got back to our room it was freezing, I grabbed a couple of heavy fleece blankets from the store cupboard next to our room. Julia boiled a kettle for our hot water bottles and we fell into bed, exhausted by it all, Julia with her earplugs and eye mask, so as not to be disturbed. What was I looking for... ?